Samsung keeps the flip phone form factor alive with the Android-powered Hennessy. After a few weeks full of rumors, Samsung released the official information needed to quell those rumors. As surprising as it may seem, the South Korean group decided to bring back the flip phone form factor and revealed the Android-powered W789, codenamed Hennessy. 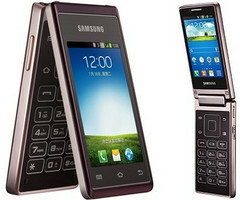 Unfortunately, the Samsung W789 is only listed on the Chinese site of the company, so it may not become available for the rest of the world.